LukeLC changed some attributes to Radio Tuner - Playback Export and Replace the Regalia's Music Library: Description changed. LukeLC changed some attributes to Radio Tuner - Playback Export and Replace the Regalia's Music Library: File 'FFXV Radio Tuner' description changed. 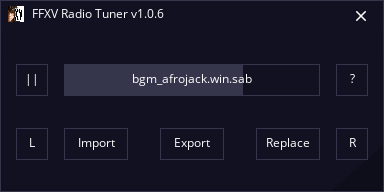 LukeLC changed some attributes to Radio Tuner - Playback Export and Replace the Regalia's Music Library: Name changed to 'Radio Tuner - Playback Export and Replace the Regalia's Music Library'. LukeLC changed permissions for Radio Tuner - Playback Export and Replace the Regalia's Music Library: Author changed their file credits.